The author observed a Red-billed Quelea colony in Capricorn Enclosure in the northern part of Kruger National Park, from 11-15 January 2010. The quelea nests were concentrated in small trees. There was ample grass with seed heads providing food for the quelea. Several nests were checked and contained eggs and small chicks (about 2 days old). About 2000 predators, mainly Lesser Spotted Eagles, congregated around the colony , occasionally flying to a nest to attempt obtaining a chick. Feeding attempts by the raptors continued through the day but with long inactive periods. 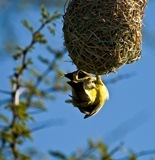 For PHOWN (Photos of Weaver Nests) records of Red-billed Quelea see here.